Still from Agnes Varda's Mur Murs (1981), featuring Asco's Death of Fashion performance. Photo credit: Harry Gamboa, Jr. Courtesy of Harry Gamboa, Jr.
LACMA curator Rita Gonzalez will be joined by filmmaker and Asco catalogue contributor Jesse Lerner to present film-related work by Asco, including slides of their No-Movies (1972–78), Super-8 films documenting performances (1972–74), single-channel videos, and fotonovelas. The evening will also include a screening of Agnes Varda’s Mur Murs (1981) which features a performance by Asco. This is a co-presentation with Los Angeles Filmforum as part of their Pacific Standard Time initiative, Alternative Projections. This public program is connected to Asco: Elite of the Obscure, A Retrospective, 1972-1987, an exhibition that traces the remarkable trajectory of the art group and showcases their intermedia art practices that continuously refused to respect categories and distinctions and sought to transgress limitations and shatter preconceptions and stereotypes. 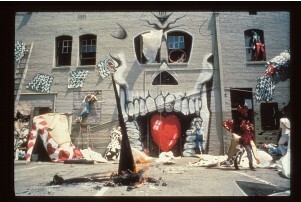 In their No Movies and in performances such as Walking Mural and Instant Mural Asco extended and exploited what film scholar David James has called "the liminal zone between the mural movements and movies proper." Agnes Varda's Mur Murs is a documentary that the filmmaker made in 1981 about murals and muralists in Los Angeles. 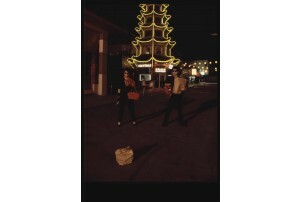 The film includes footage of Tai-chi done in front of the Margaret Garcia's "Two Blue Whales" on Venice Boulevard, footage of the likes of Judy Baca and Kent Twitchell, as well as Asco contributing a wild tableau vivant, staged on the back wall of Self-Help Graphics in East Los Angeles.